5 Cool Candy Thermometers - The Heat Is On! And your kids will thank you for it! 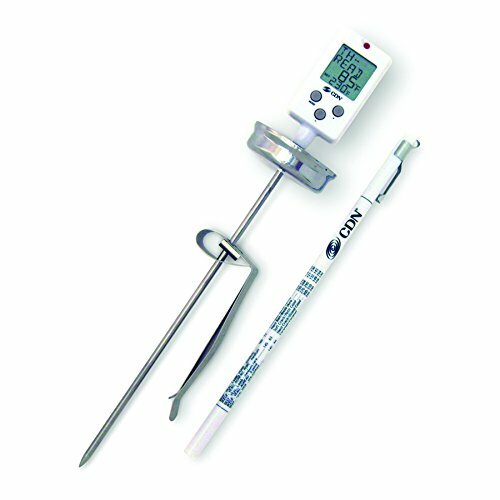 Whether you're making boiled sweets or caramel sauce, accurate temperatures are the key to everything. There is no room for guess work or “close enough”, and so, if you like to cook up a sweet treat, investing in a candy thermometer is a definite necessity. A good quality candy thermometer means you can be assured that, even at the kind of high temperatures demanded by sweet making, where other thermometers might falter, you'll know when the temperature is just right. Making your own candy is a relaxing and rewarding hobby, and one that encourages and develops patience and attention to detail. By making candy at home, you can accommodate individual preferences and dietary requirements, as well as enjoying the fun of experimenting with flavors, textures, and combinations! So – read our reviews, pick out a suitable candy thermometer, step into the kitchen, and turn up the heat! 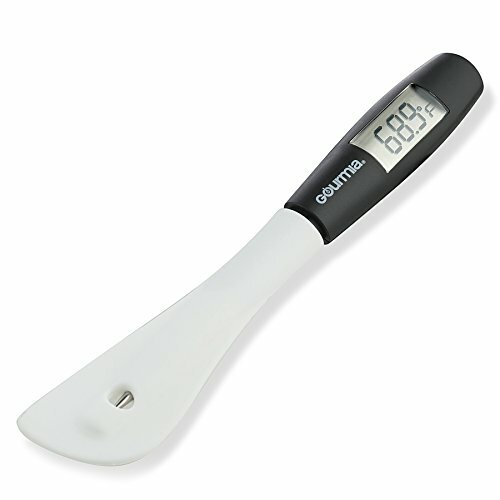 The Gourmia GTH9180 provides the multi-function practicality of a spatula and easy-read digital candy thermometer in one. Offering superior food safety, with BPA-free materials, the Gourmia is portable, non-stick, and disassembles for easy cleaning. It is not dishwasher safe, and the digital display needs to be protected from splashes, as it is not waterproof, but this shouldn't be a problem in candy making, where slow and steady are often the order of the day. The Polder THM-515 is stainless steel, with an insulated handle for safety and comfort. It is dishwasher safe, making it easy to clean, and the temperature display is easy to read. 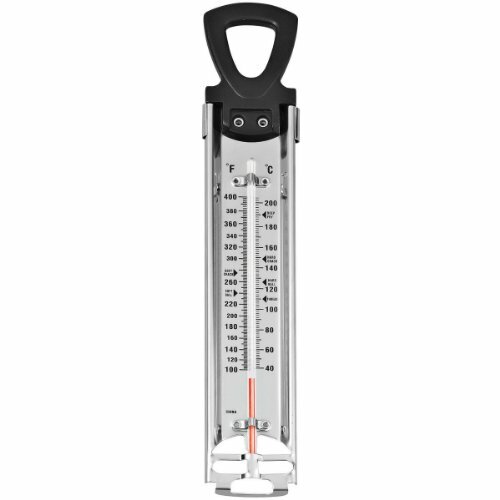 The Winco Candy Thermometer is a simple, basic instrument, ideal for beginners. It features a clip, to enable to thermometer to be securely attached to the side of a pot, and a convenient hanging loop. The drawbacks of the Winco are that this is not a digital thermometer, and the numbers identifying temperature wear off quite quickly, especially if the thermometer is used regularly. It also struggles to record high temperatures accurately. The Wilton Candy Thermometer includes candy recipes, and is easy to read. However, as it is not insulated, it can be difficult to hold while cooking. 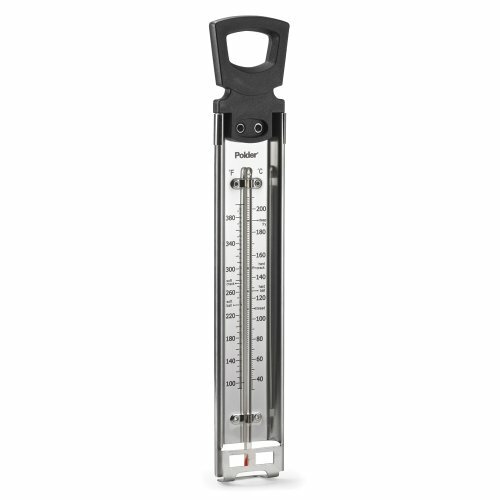 It is also not as durable as other candy thermometers, and can be quite easily broken. Finally, the CDN DTC450 Digital Candy Thermometer has an audible alert which can be pre-set to sound at key cooking temperatures, and is of stainless steel construction, making it both visually stylish, and durable. It can measure temperatures up to 232 degrees Celsius, and has seven programmable settings for the audible alert, making it the ideal accessory for all kinds of candy making. The one drawback is that it is somewhat difficult to read. When you're making candy, accuracy is key, so you're looking for a candy thermometer that is accurate at high temperatures. You also want it to be easy to read, with the temperatures at eye level, so you're not bending over a hot pan. While it seems simple, making candy is a complex affair, and requires close attention. It is particularly important not to rely exclusively on your thermometer. Although a good-quality candy thermometer will be an indispensable kitchen aid, candy making relies a lot on intuition and a “sense” of when things are ready. If you feel that your mixture is getting too hot, but the thermometer disagrees - go with your instinct. A good candy thermometer will see you through a range of sweet treats, from the relatively simple caramel or fudge sauces for ice cream, through fudge and toffee, to hard-boiled sweets. As you will be making the candy yourself, you can include your favorite flavors, your preferred amount of sugar, and can accommodate varying dietary needs and preferences. Do I REALLY Need a Candy Thermometer? The simple answer is yes. It is difficult for a beginner to judge the appropriate boiling temperature of sugar accurately, as this is very high. Regular thermometers are not designed for the kind of temperatures involved in candy making, and some can shatter. If these use mercury, your cooking is completely ruined, as even a small trace of mercury in food will render it unsuitable to eat. So, if you intend making your own candy, even only occasionally, or as a one-off, a candy thermometer is an absolute must. And you never know – it may get you started on a whole new hobby!